The National Rugby Championship is underway for the 2015 season, and even just from the first four games of the competition, some things are pretty clear. Across the four games on the weekend, there was a definite divide in terms of playing standard. The Brisbane City-Perth game on Thursday night, and the Queensland Country-Melbourne game on Sunday just looked to be played at a higher intensity, and particularly in defence, than the two Sydney games on Saturday afternoon. And the demarcation is clear; when the number of Super Rugby-quality players is high in any given game, the defensive alignment, speed and intensity is just that much better. Brisbane City with their near Super Rugby squad look well placed to defend their 2014 title, and though that won’t be a major motivating factor, they’re already playing at a level that should ensure they feature in the last two weeks of the competition. Their set piece is already impressive, they jump at the chance to attack on the back of a strong breakdown presence, and they have some serious strike power out wide. Fullback Junior Laloifi was making breaks for fun on Thursday night, and after scoring the match-winner in last year’s final, he could be heading for a breakout year already. Samu Kerevi and Karmichael Hunt looked very good as a centre pairing, and if Liam Gill stays fit, well, my goodness, he’s going to have a breakdown field day against some teams. Melbourne took a little bit of time to get into their game against Queensland Country on the Gold Coast, and I’m sure I wasn’t the only person in the first half to think the new Horan-Little Shield a massive chance of changing hands at the first challenge. But things started to click midway through the first half, and their backrow trio of Colby Fainga’a, Scott Fuglistaller and Jordy Reid started to dominate at the ruck. Flyhalf Jack Debreczeni had plenty of time and space on his hands to create opportunities, and though Country were good enough to stay in close proximity on the scoreboard, you always felt the Rising had this one covered. So it couldn’t have been timed much better that Melbourne host Brisbane City in Round 2, this Saturday. The crowd figures over the weekend rang a familiar tune to 2014. 2698 up at Ballymore on Thursday night, about 2000 at Manly Oval, where North Harbour hosted the Sydney Stars, an estimated (and maybe generous) 1200 out at Merrylands for Greater Sydney versus NSW Country, and around 1700 at Bond University for the Queensland Country-Melbourne game. The overall Round 1 total is down on last season, but the individual figures are about right for the respective clubs’ first home games last season. The two biggest challenges of the competition remain the same; getting the general message of the NRC out there to existing and potentially new viewers and spectators, and especially, building the crowd in Sydney. On the former, the ARU has certainly stepped up efforts in this department, with a new TV ad, strong social media activity, and an improved website, for which I’ll declare I’m now contributing exclusive content each week. We were told months ago that the ARU and Waratahs/NSW Rugby had agreed to share the promotional load regarding the four NSW-based clubs this season, but all the conversations I’ve had with people within the four clubs is that the level of state support has been scarce. Indeed, it was only last week that an NRC-related tweet originated from @NSWWaratahs for the first time in a month. Since then, their main activity has been retweets. On Facebook, there were a number of original posts around the competition launch and into the first game, but nothing since at the time of writing; not even scores from the two NSW derby games. But if you want to kit dad out with a Tahs jersey for Father’s Day, or renew your membership, well, they’re all over that. NSW Rugby needs to do more, but given they’re now looking for a third CEO in 12 months, that’s not something we should be holding our breath about. And if you’re in Sydney this weekend and like rugby, then Woollahra Oval is where you need to be! I’ve mentioned Junior Laloifi already, and there are some quality young punks kicking around everywhere in the NRC already. I’ve mentioned NSW Country Eagles lock Ned Hanigan several times since Saturday, and I mentioned him several time during the Fox Sports online live stream, too, during what was a storming game. He’s mobile, he’s hard over the ball, and he runs a good lineout – despite the Greater Sydney Rams keeping a very close eye on returning Brumbies and Wallabies lock Sam Carter, I can’t recall him receiving a throw. And Hanigan is just 20. I liked the look of Queensland Country flyhalf Sam Greene in a losing team, too. Just seemed to have time with the ball, which is always encouraging in playmakers. Warning: I may go on about this over the course of the competition. The NRC was disappointing for goal kickers last year, at just 71 per cent success overall, and nearly three missed conversions every game. And after a Super Rugby season in which no Australian goal kicker operated above 75 per cent, it has me on edge heading into the Rugby World Cup. A number of players kicked well over the weekend – Jono Lance and Ian Prior didn’t miss, and Angus Roberts, Jake McIntyre, and Hamish Angus all kicked at 75 per cent or better. But it was a bit disappointing to see Debreczeni land only half his six attempts, and Queensland Country’s Greene and the Rams’ Paul Asquith each pushing several attempts wide. Across the competition, 12 conversions from 36 attempts were missed in Round 1. 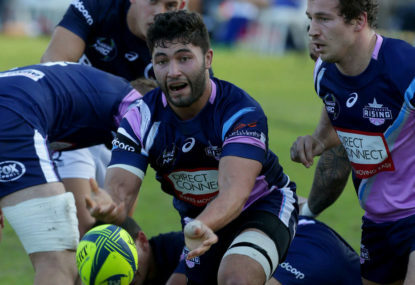 Greater Sydney kicked two from five for the day – and lost their game by a point, after scoring one more try than NSW Country. Random piece of trivia to finish: The Sydney Stars had a forgettable 2014, but after the weekend they remain undefeated against North Harbour over the history of the competition!